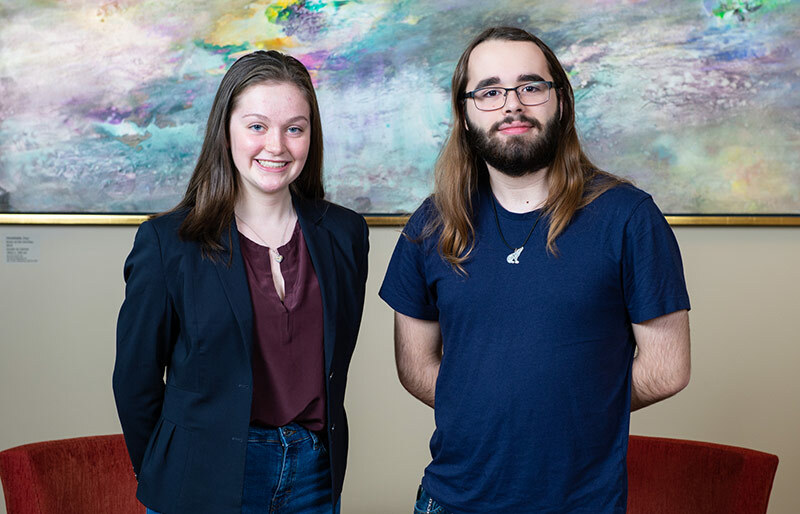 Geoffrey Noseworthy of Lewisporte, Nfld., and Anna Postill of Toronto have been named the University of New Brunswick’s recipients of the prestigious Schulich Leader Scholarship. This year, out of a pool of 350,000 potential candidates across Canada, 1,400 students were nominated, of which 50 received this celebrated award. Mr. Noseworthy, 18, is a recipient of the $80,000 Schulich Leader Scholarship. A graduate of Lewisporte Collegiate, Mr. Noseworthy attended SHAD, Encounters with Canada and the Newfoundland and Labrador Youth Parliament. He will be entering a concurrent bachelor of computer science and bachelor of mathematical physics program this fall. Mr. Noseworthy was selected for his outstanding academic and extracurricular achievements, ranging from duties on student council to forming computer science, chess, debate and equality clubs. Ms. Postill, 17, is a recipient of the $100,000 Schulich Leader Scholarship. A graduate of Leaside High School in Toronto, Ms. Postill will be entering the bachelor of science in engineering program this fall. Ms. Postill, who assisted in the development of the SHAD program in Prince Edward Island and was consulted by Ontario politicians to develop active transportation policies, was selected for her outstanding contributions in the classroom and her school, most notably by leading environmental and mental health awareness committees. Schulich Leader Scholarships are prestigious entrance scholarships awarded to 50 high school graduates enrolling in a Science, Technology, Engineering or Mathematics (STEM) undergraduate program at 20 partner universities in Canada. Each year, every high school in Canada can submit one Schulich Leader nominee based on academic excellence in STEM, entrepreneurial leadership and financial need. Recognizing the increasing importance and impact that STEM disciplines will have on the prosperity of future generations, businessman and philanthropist Seymour Schulich established this $100 million scholarship fund in 2012 to encourage our best and brightest students to become the next pioneers of global scientific research and innovation. The University of New Brunswick (UNB) is Canada’s oldest English-language university and one of the first public universities established in North America. Founded in 1785, the multi-campus institution is home to over 60 research centres and institutes, groups and ongoing projects. The university offers over 75 undergraduate and graduate programs in 100 disciplines. UNB has more than 10,500 students from more than 100 countries, and several thousand more take UNB courses online and at partner institutions around the world.